DURING business hours, Chartered Professional Accountant Paulina Konopacka is a senior finance manager with Loblaw Companies, the food and pharmacy conglomerate based in Brampton, Ontario. But every other hour of the day, she's an ardent dog lover who volunteers with two dog rescue organizations, Save our Scruff and Save Me Rescue. Paulina logs about 40 hours each week managing a huge roster of rescue volunteers, taking care of her own three dogs and welcoming a continuous roster of foster pups. Paulina became a CPA in 2015 and has worked at Loblaw in finance for almost eight years. She had always wanted to get involved in dog rescue. "Then, about two years ago, I met a coworker who was here on a contract, and she introduced me to Save Our Scruff." The Toronto-based non-profit organization is dedicated to rescuing dogs and finding them safe and suitable permanent homes. "I started off doing transporting and home visits and now I’m the volunteer manager for them," she explains. "I manage about 800 volunteers." Eventually, Paulina began working as well with Save Me Rescue, a registered charity dedicated to rescuing homeless and abandoned dogs. "Between both rescue organizations I probably do about an extra 40 hours a week," says Paulina. "Weekends are filled with adoption events and I like to have at least one foster most of the time. It’s a lot, but I love it. It’s so rewarding. There’s nothing else that I’d rather do with my time." Dog rescue organizations often provide temporary, in-home care for animals that are not ready or unable to be placed in permanent homes. These animals are often referred to as "foster dogs" and volunteers like Paulina are "foster parents." Sometimes, the dogs are perfectly adoptable and ready to go to their "forever homes," but they've simply run out of time at their shelter homes. A good rescue organization will make the most of an extensive network to help potential adopters find the right family for each dog. Save Me Rescue, for example, works with shelters in the United States and Canada. Typically, dogs come to their foster homes each weekend by way of dozens of volunteers driving multi-hour legs of a transport convoy. "Some of these dogs have never known love or affection before," says Paulina. "Seeing them start to open up while they’re in your care — watching them wag a tail a little or accept a treat — those are the little things that make it so worthwhile." As a child, Paulina had pets but not a dog of her own. 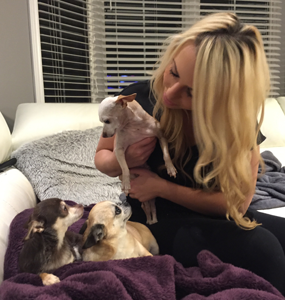 Soon after moving out of her parents' home, she got involved in fostering dogs, and would eventually adopt three dogs of her own, all Chihuahuas. Odie, the first of three, was just the second dog she had fostered. "Odie’s a 15 year old Chihuahua from L.A. and he’s bald and wrinkly and he’s got liver spots everywhere. When I first got him he would bite me and I remember just wishing this dog would get adopted and quickly! But then after a couple weeks, he started coming out of his shell and he turned out to be the most amazing little old man." She warns there is often an adjustment period for all parties involved, including your own, permanent pets. "The foster dog might be fearful and you don’t know what they’ve been through." A rescued dog may have been abandoned, neglected or abused. They may have been housed at stressful shelters. And they often make long journeys by car to get to foster care." Adds Paulina, "You can also get a fantastic, confident dog that just fits in right away, as if they were always a part of the clan. You never know." There's an inspirational side to the story as well. "You also see so many people who want to volunteer and adopt and open up their homes. I get updates from some of my adopters — sometimes weekly updates! It’s so nice to hear those stories and see how well the dogs are doing." At Loblaws, Paulina started off in franchise accounting, then moved on to support pharmacy and health and beauty. "From there I did procurement finance and now I’m in IT finance and I’m supporting a lot of the capital IT projects." She says the company encourages a healthy work-life balance. "If you’re happy at home then you’re also happy at work. With that balance, she is able to devote her time after-hours to dog rescue." She also praises Loblaw for donating to the charities of employees. "I’ve been fortunate enough to be able to have Loblaw support Save Me Rescue through their grant program," she explains. Paulina notes the similarities in her professional and personal life, saying "Once I’ve started to plateau, I think it’s time for change." In fostering dogs, she says, she prefers to move efficently to ensure each dog gets into its "forever home." Says Paulina, "I don’t want that dog to think that my home is his forever home because then he’ll get his heart broken. That’s good for me, too, because I don’t want to get too attached. I approach each new foster experience thinking, 'I’m just babysitting, I’m just the middleman. "'I’m getting him ready for his next journey.'" Melissa Campeau is a Toronto-based freelance writer. To find out more, download the Province of Ontario Breed Specific and All Breed Rescue Contacts, or contact a dog rescue organization and ask how you can help.